"The great thing about beans are the endless variations. After years of experimenting, I've settled on this recipe, which is loaded with flavor. I like to put mine in the refrigerator overnight, then scrape the fat off the top before reheating. Serve with a good, crusty bread." 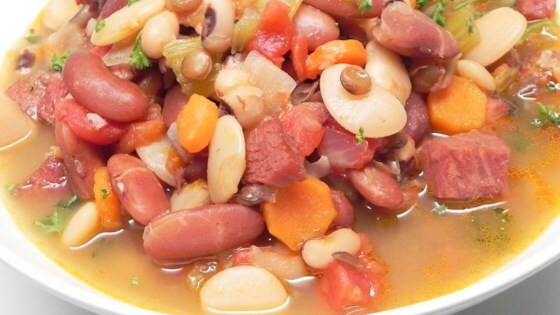 Rinse navy beans and 12-bean mix thoroughly and set aside. Melt butter in a large stockpot over medium-high heat; saute onions, carrots, and celery until onions are clear and soft, 15 to 20 minutes. Mix bean mixture, ham hocks, tomatoes, beer, green chiles, chicken soup base, chili powder, cumin, and cayenne pepper into onion mixture; add enough water to fill the pot. Bring liquid to a boil, reduce heat to low, and simmer, stirring occasionally, until beans are soft, 6 to 8 hours. Substitute 2 quarts chicken stock for the soup base, if desired. Great flavors! Easy and quick to put together for a couple or large group.